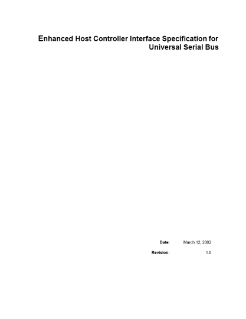 The document describes the enhanced host controller interface for universal serial bus revision 2.0, including the interface between system software and host controller hardware interface. • Full support for all USB 2.0 features. • Low-risk support for full- and low-speed peripherals. • Simple solutions to USB 1.1 host controller issues. • Optimized for best memory access efficiency. • Support for 32- and 64-bit addressing. Read the full Enhanced Host Controller Interface for USB 2.0 Specification.